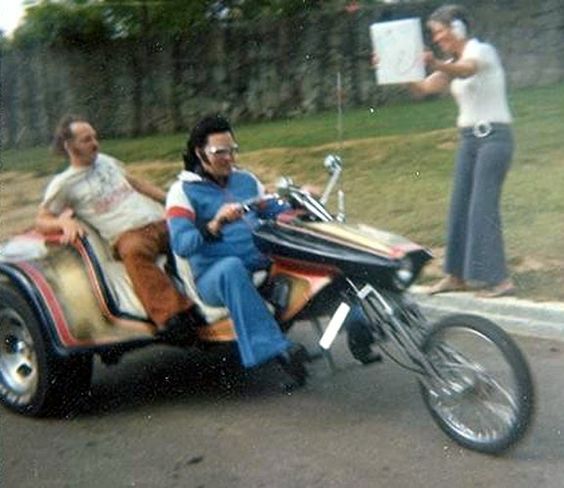 Taking Care of Business, our Trikes Editor has painstakingly compiled a comprehensive track on Elvis owned Trikes. Play the record, visit the Trikes site, feel the energy. “I wasn’t popular in school … I failed music—only thing I ever failed. And then they entered me in this talent show … when I came onstage I heard people kind of rumbling and whispering and so forth, ’cause nobody knew I even sang. It was amazing how popular I became after that.” – Elvis reminiscing about his 1953 song and dance routine. In 1954, Elvis finally got himself a job as a truck driver. A job many of us who dream and chase dreams know as the job that pays the bills for the expensive hobby of dreaming. 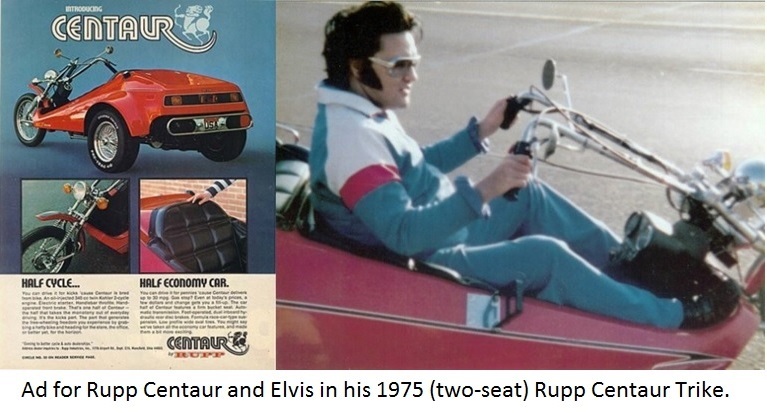 In the summer of 1975, Elvis bought several Trikes (three wheeled motorcycles), the first of which was a 1975 Rupp Centaur with a 340cc two stroke engine. Within weeks two other types would follow. They were the 65 bhp, 1600cc Volkswagen engine trikes based on Ed Roth designs. The two VW Trikes were seen many times on the road with Elvis Presley riding it in and out of his Graceland home.